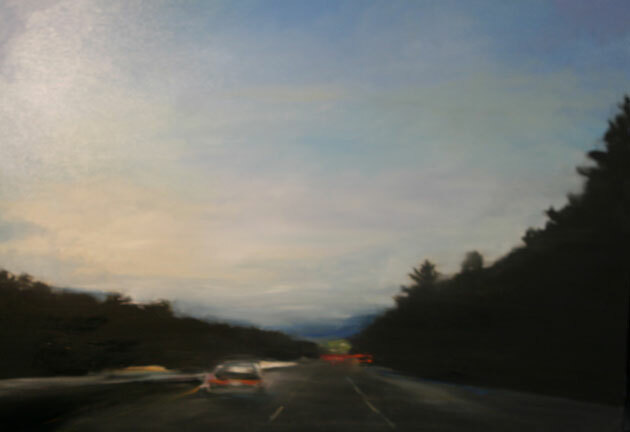 John MacAdam - These recent oil paintings of highways at dusk are an examination of overlooked places that are peripheral to our vision. 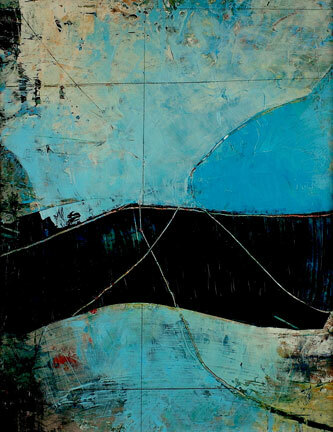 MacAdam focuses on ambiguous moments of movement. The images invite contemplation of the subtleties of the land and invoke wonder at the familiar. Mimmo Roselli - Measuring the Space begins the sixth series of site-specific sculpture-installations that have been presented in various museums and galleries over the last few years. 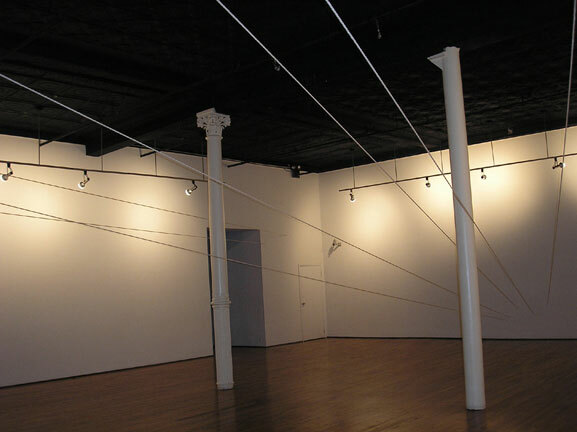 As with the works preceding the current exhibition, the sculpture consists of wires under tension that proceed from wall to wall and produce an alternate dimension inside an otherwise cubic zone. The interior and exterior sculptural space becomes a co-protagonist of the work. 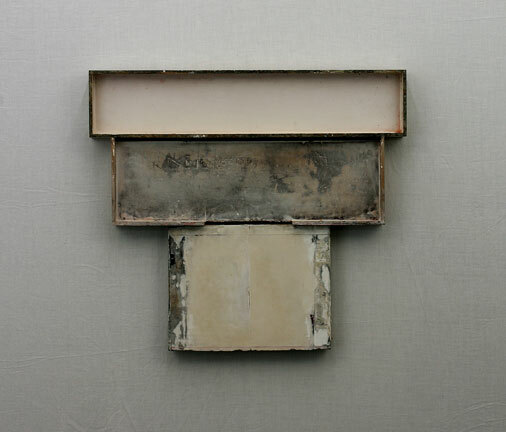 Gerry Keon - Keon’s preferences lie with humble materials that are then constructed in an unlikely fashion in order to “find” the very objects that emerge from the process. The objects discover themselves through the trials and tribulations of the artist’s dissatisfactions with them, an endeavor involving their constant dismemberment and reassembly. Whatever qualities they may possess emerge through the many processes they have been subjected to and are as surprising to their maker as if they had, indeed, been found amongst builder’s debris or upon a stretch of beach. Anthony Sorce - The twenty-two non-referential paintings in this exhibition are works on paper and paperboard. Physically rich layered surfaces are built in combinations of drawing into wet paint, scraping and glazing. Also occurring is a strong interrelationship of color and light rendering in most instances an acute impression of emerging light. The resulting visual images from this body of work engage and reward the viewer with a sense of poetry, passion and artistic precision. 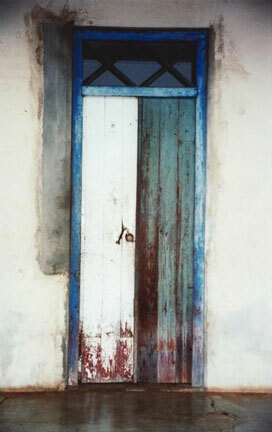 Steen Valde Larsen - This Danish artist shot this series of color photographs of doors in Cuba over the past ten years. Larsen approaches each image as if he were an abstract painter considering a composition. Each door, expressive, isolated and in a state of decomposition or disrepair loses its utilitarian identity and instead becomes a solitary abstraction.